Sustainable Van der Sar Import B.V.
We supply sustainable rattan planters because this is important to us. We even take it a step further and manage the entire process, from harvesting to customer delivery. We keep a sustainable ear to the ground concerning the harvesting and replanting of the rattan, as well as the manufacture of our planters. Our sustainability policy is supported by local, regional and national authorities because they too aim to create a sustainable living environment for their people. Our involvement and close collaboration with various local partners means that we are helping to maintain the tropical rainforest and offering employment and a decent wage to local people. We’re building on a better future for the entire family and the community. We know that consumers in several European countries have big interest in responsible produced products. 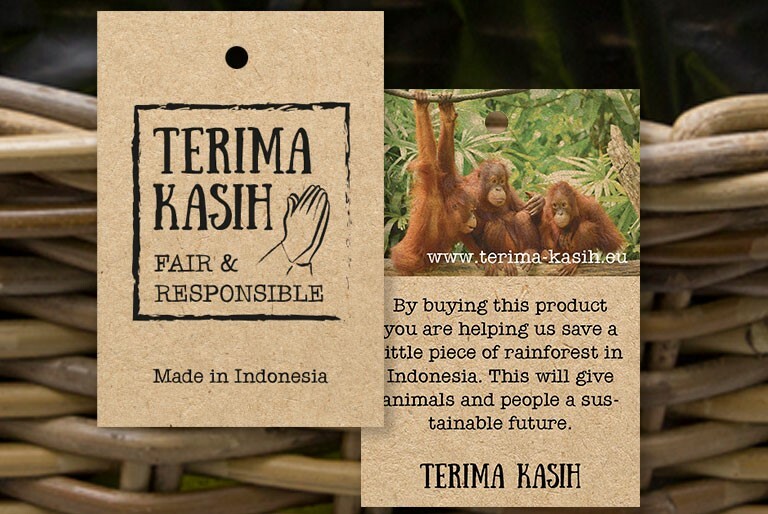 By the end of 2017 all our baskets get a TERIMA KASIH - LABEL. On every label they find the TERIMA KASIH website-link. We want to inform customers about sustainable harvesting and how we make our rattan products. We hope they will be our ambassadors and ask for TERIMA KASIH products in garden center and flower shops again! Our goal is to make our total production of sustainable harvested rattan. We hope we reach this goal by the end of 2017 / first months of 2018. Farmer groups in several villages in the rainforests of Indonesia harvest for us already now. We thinks to have enough regular harvesting groups by the end of 2017. At that moment we will start the process of certification and audits by an international independent organization. Several customers have asked us for this proof. Last november Gerard van der Sar was invited to speak at the International Rattan Congress in Jakarta. Gerard spoke to an audience of more than 100 rattan-specialists, who came to Jakarta from all over Indonesia. He informed the audience about the developments in sustainability Europe. He also spoke about the project SUSTAINABLE PRODUCED RATTAN BASKETS, which Van der Sar Import realises in Indonesia. The minister of Industry, Mr. Hartarto, was also invited to the congress. At his presence Gerard van der Sar signed an agreement with a large organisation of rattan-farmers to confirm their cooperation. This organisation harvests sustainable rattanin the forests of Indonesia for Van der Sar Import.